Aphids - Applied Bio-nomics Ltd.
Aphids are a fascinating insect. Many, including our well known Green Peach Aphid, have two, three, or more, completely unique life cycles. The black flying aphids that move into your greenhouse may be the same ones that are all green, without wings, surrounded by 10 “babies” a month later. 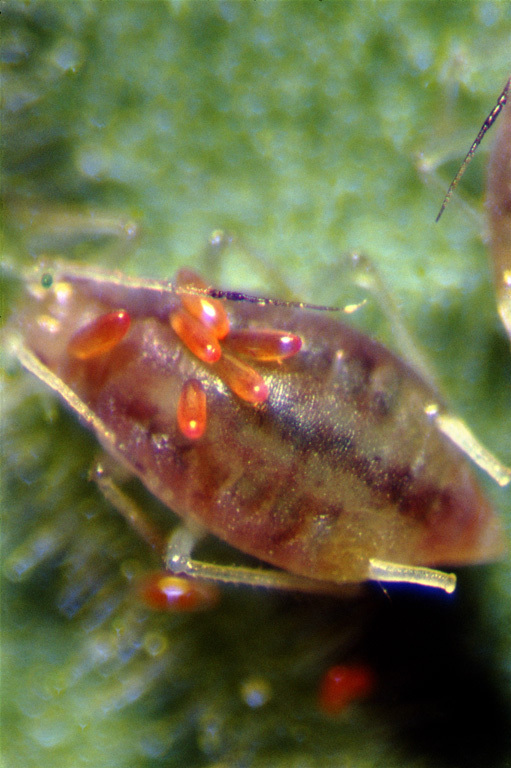 The phylloxera-like insect eating your plant roots may also be the same aphid. The more I get to know about aphids, the more I am amazed. Managing aphids will always be a challenge. Don’t even think about eliminating aphids. They are so diverse and adaptable that even if you did eliminate them, it would probably lead to the end of life on this planet. Fortunately for us, everything that eats insects loves aphids. They are sweet. They are dense. They seldom defend themselves. They are the living example of “the best defense is a good offense”. Their strategy is simple; just reproduce as fast as you can and you will hopefully survive. This pre-amble explains to some extent what you see in your crops. When a Green Peach Aphid flies into your crop, it lays its eggs in its favourite plant. The flying stage is “diploid”, like humans, some are male and some are female. This allows for sexual reproduction which is the fastest way to select for the appropriate characteristics, such as temperature range, host suitability, and chemical resistance. Once they have mated and reproduced, they shift to “haploid” stage which is asexual. At this stage, they are all female and the ten little babies surrounding this wingless adult are actually clones, all perfectly adapted to your crop and chemicals. In the haploid stage, the Green Peach Aphid can complete its lifecycle in about a day. If you had a good scalpel and a steady hand, you could dissect one of those “little babies” and find another 10 of them in their abdomen. This explains why you suddenly discover a plague. Over one weekend, in ideal circumstances (your protected greenhouse is ideal), 1 aphid can become 10,000 or even 100,000 by the time you take a walk on Monday morning.